It was his first big game hunt. 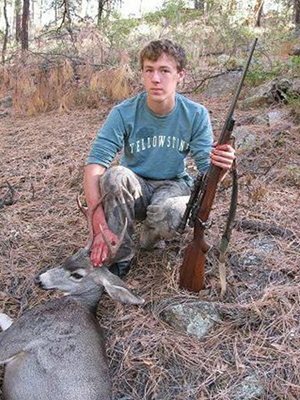 My stepson, Graham, had drawn not just a deer tag for the 2009 Junior season which coincides with fall break, but also a javelina tag for the same area at the same time. Due to school commitments we did not leave until very early of opening Saturday. He had chosen to pursue javelina first, since they tend to be easier to bag, if you can find them. When he exited the 4Runner all the enthusiasm of a fifteen year old was bottled up within him, propelled him. We proceeded to climb small knolls, from which the binoculars were employed. Nothing showed up in the first two hours. Arriving near a steeper mountain, it happened. Graham busted out what looked like a fine specimen of a mule deer buck. Not a stupid one, either, because this big boy did not waste any time putting distance between us. Tough shots soon rang out since Graham took them anyway. None connected. The deer disappeared over the next ridge. And with him he seemed to take much of Graham’s good spirits. Here was a perfect example of how reality can deflate a guy. The disappointment of not getting that buck lingered for quite a while. We returned to the vehicle, a mere speck in the rugged landscape, encountering neither deer nor pig. After lunch a change in location offered other possibilities. There had always been pigs at that mountain, and occasionally also muleys. At the price of climbing steep, brushy slopes we did flush out a javelina, but Graham did not even get this runner into his scope. And to test his resolve even more, at last light two more porkers emerged briefly from the brush, but he could not find them in his optics. At dinner I had one exhausted, disappointed, christened-by-reality young lad on my hands, who’s ideas of hunting had just been thoroughly set straight. We left for the woods near Prescott the next day. After one more frustrating afternoon and evening his luck changed rather quickly. Very early Monday morning a forkhorn cooperated, only bounced off for several yards after we crossed paths. Graham, armed with a sporterized Springfield that his Grandfather arranged for him to use, sent one 165 grain softpoint that put the buck down, but not out. That job, from fairly close distance, got accomplished with a downloaded 110 grainer. I congratulated him on his first big game kill. His moment of pure happiness was short. Graham also did the field dressing and soon thereafter the skinning. In the mean time I had moved the Toyota within about a hundred yards of his kill. Since a perfect oak tree happened to grow where Graham had killed his buck, we pulled the deer up in it. When all the work was done and some morning breeze had cooled his muley down nicely, we carried the meat in an ice chest back to the Toyota. At that time Graham simply wanted to go home, ‘had enough of nature for awhile’, as he’d put it. So we did. I’m not sure about it, but I believe Graham is beginning to understand that this trip wasn’t just about hunting. 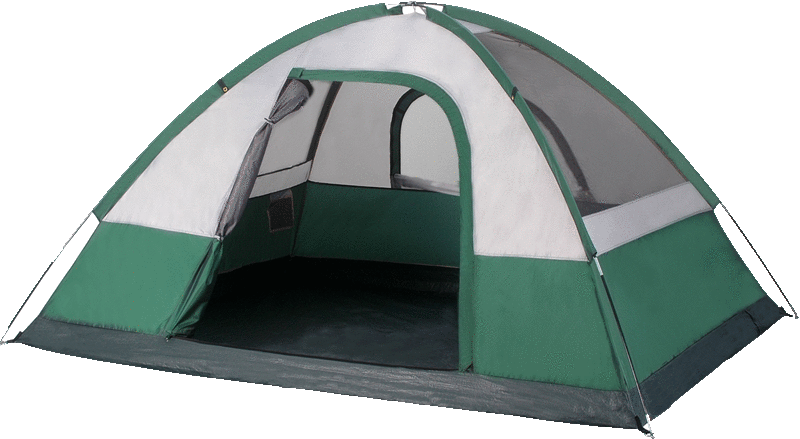 It was an adventure, unstructured activities in the great outdoors. It required hard work, and provided a taste of this wild and rugged Arizona. Nature threw out some of her challenges, examples that a man constantly faces some sort of struggle, and deals with it. Graham may have complained a lot, but he took action nonetheless. I’d hunt with him again. But that week he opted to not pursue a javelina. Fast-forward ten days, to another deer hunt. In case you don’t know, I’m a lucky guy. After killing a cow elk last year, on my application I opted for a new hunt unit in 2009, one with better drawing odds, and drew another cow elk permit, for 19A. But this is about deer. Since I had never hunted in 19A, choosing this unit for first choice deer made sense, so I could scout while hunting deer. Yep, I’m a lucky guy … I got that 19A deer permit as well. There were three of us on this hunt. On opening day, Ron and I carefully approached a nearby waterhole. We decided to wait in ambush at that water source. We saw nothing. An hour later we split up. Not five minutes later I detected a small group of deer, some three hundred steps away, up a gentle rise, slowly drifting through the junipers. I couldn’t be sure if one of them was a buck, and never saw them again. This was mostly juniper country, where open terrain was rare. “3X” country, where a scope is almost a handicap. Distances are short, shots, if you’d get one, would be fast. Better dial to 3X. I slowly moved in a wide circle back to camp. Right before noon a whitetail buck provided brief excitement. He came busting out from under a tree, knew what he had to do, panicking down the steep slope. All I had in the scope was the last two or so inches of his grey back, for a fraction of a second before Mr. Whitetail was completely gone from sight. Not five minutes later a shot roared. As it turns out, it was from our buddy’s .300 Win Mag. This Ron (we had two Rons on this trip) had chosen a different strategy for that morning. We had cell phone coverage up there. Soon mine buzzed. Ron excitedly reported that he had played cat and mouse with this big buck for about an hour. He had seen him four times, in a space of maybe a hundred and twenty yards squared. He had finally been able to take a shot on their fifth encounter. It was a big-bodied deer with, for Arizona, very large whitetail antlers above a whitetail face. But his tail was that of a muley. Didn’t matter, we had a very happy Ron on our hands, and a job to get his big buck back to camp, which according to GPS wisdom was 0.6 miles away. With the three of us, this task was finally accomplished by about 3:30 PM. The other Ron and I took it easy that evening, sitting in promising and separate places, but not doing any harm to anything. Saturday we crisscrossed the same hill where the big buck had resided. But neither of us detected any deer. Meanwhile ‘happy’ Ron left camp, ended his hunt to get his big boy to a taxidermist. And oh by the way, there was sign of elk, but very few. None of us ever actually saw one. Not on this hunt. Not during my five scouting outings, either. Sunday morning activities began way before daylight. Big game hunting is a special affair. 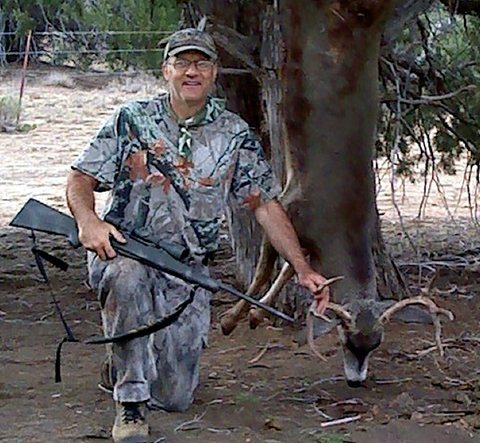 Unless you enjoy all of it, the preparations, scouting, camping, physical efforts, fruitless wanderings, and this rugged Arizona land, you’re not going to like big game hunting. If you get lucky, encountering an animal that matches your tag, taking a shot, those things happen in rushing moments. The rest is work. I left camp in the dark that Sunday morning, fueled by a mix of faith and passion. There wasn’t much of a moon. Yet the dirt road, back to the same waterhole from the first day, was easy to follow. As the eastern light pushed away the darkness, slowly sucked the grey from the surrounding hills, I stopped more often to let my binoculars do the walking. Nothing. This time I followed the road past the pond, and eventually up the hill. Noise could not be avoided, but hopefully minimized. Not more than a hundred paces up the slope my feet stopped as my eyes confirmed “deer body”, maybe just shy of a hundred paces off the road to my left. My business partner slowly and carefully swiveled off my shoulder – I carry muzzle down. The first anxious glance through my scope, still at 3X, told me that I had to take one more careful step to see the deer’s head. That provided the confirmation: antlers! Soon the crosshairs, having to navigate through some close-by catclaw tangle of twigs, found the buck’s rib cage, if only somewhat further back than I had wanted. It always amazes me. No practice, and I do plenty of off-season shooting, provides the shortness of breath, the noticeable increase in heart rate that kicks in instantly when those crosshairs cover an animal’s body. I squeezed, unleashing 150 grains of lead- free Nosler boattail. As the Tikka T3 came out of recoil (which I never felt, and neither was the shot loud), there was no more buck. Only a branch on the juniper he had been in front of shook noticeably. I operated the silky-smooth bolt and scanned the terrain for movement. There was none. Minutes passed. Eventually I picked up that empty .308 case, and slowly approached the juniper. No deer. Just a broken twig shining amongst the evergreen. But wait, there’s more. A small piece of what looked like and felt like liver dangled off a twig right next to the one clipped by my bullet. And a bigger chunk lay in the dirt at the base of this tree. About ten feet out the buck had left obvious dig marks from all four of his hoofs. A little further the first blood stained the desert. Then more. And then, yuk, some gut content. And more of that. 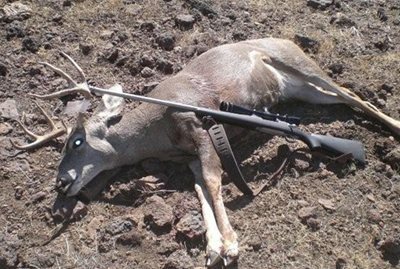 About thirty yards from where that Nosler had connected I found my muley, expired. I tagged him. This ‘red work’ had quite a bit of green content, and I apologized. Oh, yes, the cell phone. Ron answered. He had heard my shot. I talked him into fetching his pickup and directed him towards me. He helped me drag the deer back to the road. We loaded my buck onto the Ford’s tail gate, and this boy was hanging in camp by the time the sun had climbed the hill to the east. Ron called it a day after that, after helping to get two fat deer into camp. That morning the weather invited. Clouds dominated the sky, and a cool breeze encouraged. I skinned my buck. While he cooled it made sense to prepare the European mount. Both Rons had left plenty of water to fill my stock pot. Soon the skull rested in boiling water. Meanwhile I began to de-bone my buck, enjoying that as well. While working the meat I could not help but wonder. Wonder at this awesome, rugged country. Wondered why that buck was where he was, after we had hunted and disturbed the country for two days straight. Wondered at the perfect morning weather to process him right here and now. Wondered at the calming, recharging, encouraging effects nature provides, if we let her. By about 1PM, all was done. Time to head home from a great hunt. Time to thank the Lord.